Cigarette smoking is the leading cause of preventable disease and death in the United States, accounting for nearly 480,000 deaths annually. 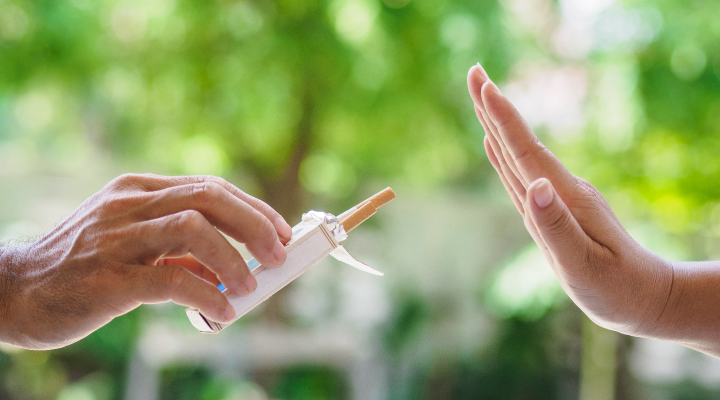 Even though reports exclaim that cigarette smoking is at an all-time low, we are far from the goal of extinguishing an addiction with severe risks to oral and overall health. In Virginia, 10,300 adults die from smoking-related illnesses each year. Smokers are more likely to develop heart disease, stroke, and lung cancer than people who don’t smoke. The oral health risks of smoking are shocking, as well, especially when you consider the risk of oral cancer. Your teeth have enamel, and enamel has pores, just like a sponge. They make it easy for stains to occur if you don’t take care of your smile. Cigarettes contain tar and nicotine that can easily stain your teeth in a short amount of time. The chemicals in cigarettes can also cause distinctively bad breath. Instead of temporarily masking the problem with gum, mints, or mouthwash, why not eliminate the source and quit smoking? Many resources are available to help you leave smoking behind. Smoking cigarettes can change how things taste. One study from BioMed Central found that chronic exposure to cigarette smoke significantly affects taste buds. Their research showed that the higher the nicotine dependence, the lower the individual’s sensitivity to taste. Researchers concluded that quitting smoking can lead to a rapid recovery of taste. Patients monitored in the study showed an increase in taste sensitivity in as little as two weeks following smoking cessation! Quit today and taste what you’ve been missing! Periodontal disease, or gum disease, occurs when the gums supporting your teeth become infected from plaque build-up. People who smoke are twice as likely to get gum disease because smoking cigarettes weakens your body’s immune system, making it harder to fight infection in the gums. Furthermore, treatment for gum disease may not be as effective due to the continuation of smoking. The more cigarettes you smoke and the longer you smoke, the higher the risk. Smokers and excessive drinkers have the highest risk for developing oral cancers. Since many dentists check your mouth for oral cancer symptoms, regular dental visits will help you catch any signs early on. The best way to avoid oral cancer is to stop smoking and visit the dentist for any existing problems. An estimated 53,000 people will get oral cancer in 2019, and nearly 11,000 will die because of it. If you’re ready to quit, you don’t have to start the journey alone. There are local resources that can help you. Take the first step in taking back your oral and overall health today.